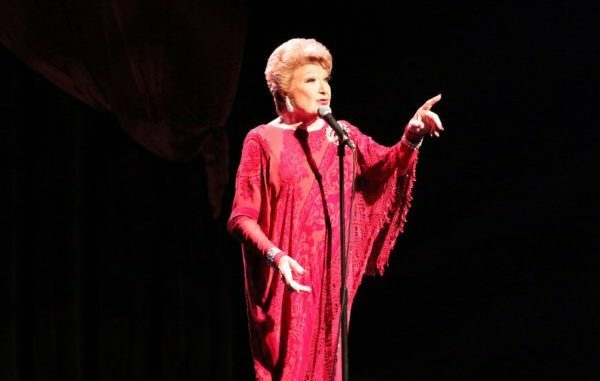 By popular demand, ScoBar Entertainment & The Iridium are proud to present award-winning vocalist MARILYN MAYE in a special Valentine’s show, Marilyn Maye – always from the heart, for a four-day engagement, Thursday - Sunday, February 14-17, 2019. In celebration of Valentine’s Day, there will be two performances on February 14th one at 7pm & another at 9:30pm. She will be accompanied by her trio. MARILYN MAYE has been described as a singer, an entertainer & sometimes an actress & comedian, but the word that most of her fans would use is “phenomenon.” She is an unstoppable ball of energy, equal parts of Ella Fitzgerald & Ethel Merman, one that would be remarkable at any age, but even more so for a woman who just turned 90 & has been entertaining professionally for at least 80 of those years. At 90, Maye’s raw firepower is astonishing, but we shouldn’t let that overshadow the other attributes of her music, namely her amazing subtlety, her gift for underplaying a lyric & her capacity for narrative. She is one of the few artists of any generation who is a great jazz singer with a remarkable sense of swing & also a full-on theatrical singer with an equally great sense of drama & storytelling. She can deliver a punch-line like no one else & with a single wink of her eyes or the expression on her face, make an entire audience laugh so hard that they can barely breathe. Throughout most of the 1940’s & 1950’s, Marilyn sang in nightclubs in Kansas City, learning her craft; how to swing, belt the blues, personalize a lyric & capture the full attention of an audience & then hold it. She worked steadily, but later regretted that she didn’t have much incentive to spread her wings beyond her native Missouri. It wasn’t until 1960 that she came to the attention of TV superstar Steve Allen, who put her on his NBC show & her career began to reach a national stage. From Mr. Allen she attracted the attention of other tastemakers & impresarios, including Ed Sullivan & Johnny Carson, as well as RCA Records, for whom she made seven albums & many singles in the late 1960’s. In the 1970’s she was the queen of the late night talk & variety shows, making more appearances on “The Tonight Show with Johnny Carson” than any other entertainer. She worked extensively in regional theatre (she was everybody’s favorite “Dolly” throughout the Midwest), working in every city in the country, except for New York. It wasn’t until 2006 that she made her “comeback” in the city, starting at Metropolitan Room (then Feinstein’s, Birdland, Iridium & 54 Below) & beginning around 2015, as a special guest at Jazz at Lincoln Center. Copyright © 2019 *NiteLife Exchange*, All rights reserved.